Downtown - The City of Ridgefield, Washington | Forward Thinking. Rooted in Tradition. 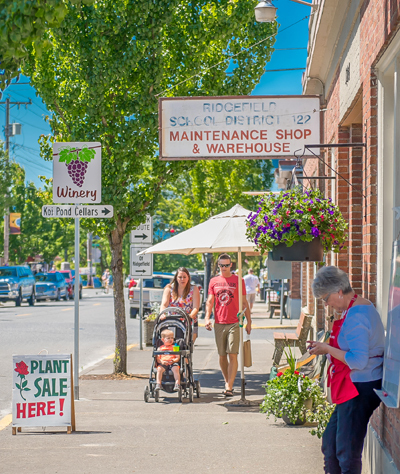 With sweeping views of the Wildlife Refuge, downtown Ridgefield’s tree-lined streets are the perfect place to enjoy a number of unique shops and charming restaurants. A pleasant walk along Main and Pioneer streets will take you past a salon, coffee house, antique stores, gift boutique, tea house, historic theater and more. Downtown Ridgefield is also the City’s civic center with City Hall, the post office, community library, community center and police station. Downtown also offers four community parks including Overlook Park, Davis Park, Abrams Park and a Community skate-park. Overlook Park, at the intersection of Pioneer and Main, offers a plaza, a stage with interpretive panels and amazing views. It is used as a gathering area for citizens and is the focus of many community events including the Farmer’s Market, First Saturdays, and summer Tuesdays in the park. West of this intersection is the Lake River waterfront with public access to the water for fishing, boating and other water recreation. The waterfront property, owned by the Port of Ridgefield, includes 40 acres of open area, a paved waterfront trail, a public boat launch and views of the Refuge. The adjacent marina area serves a variety of uses, including covered and uncovered boat slips, boat houses, the Clark County Fire & Rescue fire boat house, a kayak rental business, upland parking and a floating home community. In 2009, the City of Ridgefield embarked on an Integrated Planning Grant project to develop a shared vision for the downtown and waterfront areas. The complete Downtown Waterfront Integration Plan can be found here. In 2017, design will begin for a rail overpass to provide a new, direct road access to the Lake River waterfront from downtown Ridgefield. The overpass will include pedestrian and bike trail connections between downtown and the waterfront as well as areas to stop and enjoy the view of the natural waterfront amenities.